If y'all recall I mentioned that I was excited for these things at the State Fair of Texas: Corey Morrow// Kacey Musgraves// Fried Food// My yearly Ferris Wheel Ride// Car area. 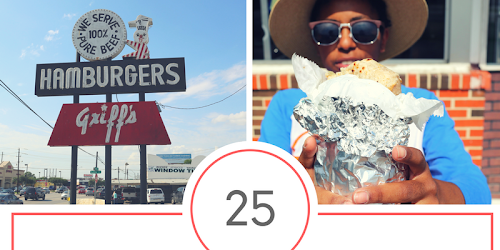 This week will be all about the State Fair of Texas on le blog. There is to much to load in one post. Alright y'all, are y'all as excited as me that it's finally starting to feel like fall here in the South. Especially here in Texas where it always seems to be hot. We joke that God doesn't put Texas through a Winter cause a Texas Summer is bad enough. Wait, have I told that joke before. Anyway, let's move on y'all. Fall get's me excited because it brings: my birfday, The State Fair of Texas, Football and an overall great time. This past weekend I attended the SFTX twice and I'm still not done. 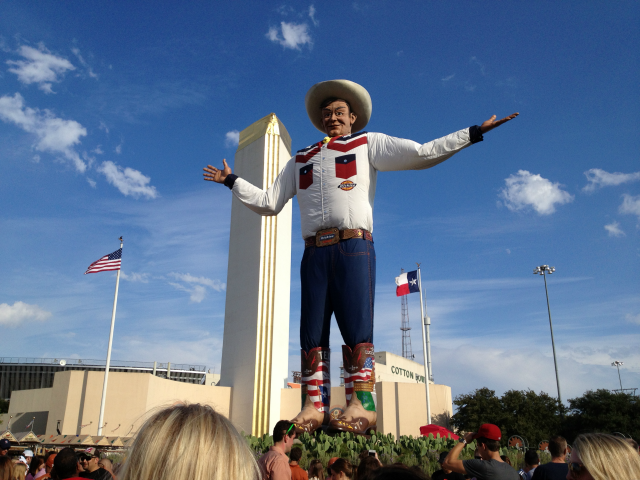 Obviously the first thing I did when I got there was check out the new Big Tex. For y'all not from Texas, Big Tex burst into flames last year and it was tragic. People cried y'all. 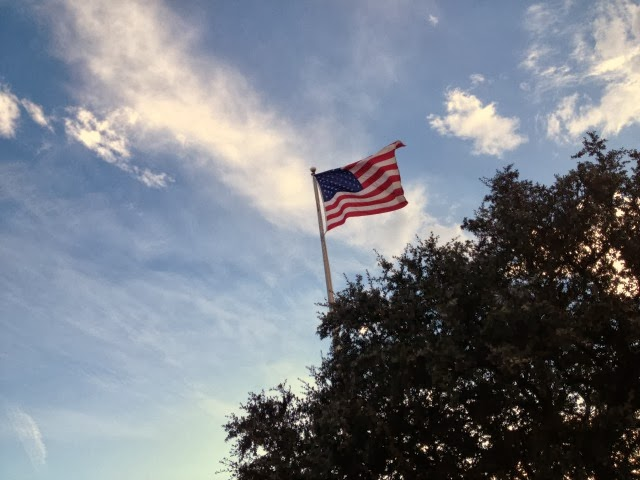 Here in Texas we take pride to a new level. And when something has been apart of your State for 60 years it's a big deal. Y'all I was excited to see what he looked like. Plus I just had to hear him say, "Hooooddddeee, fooolllllks!" 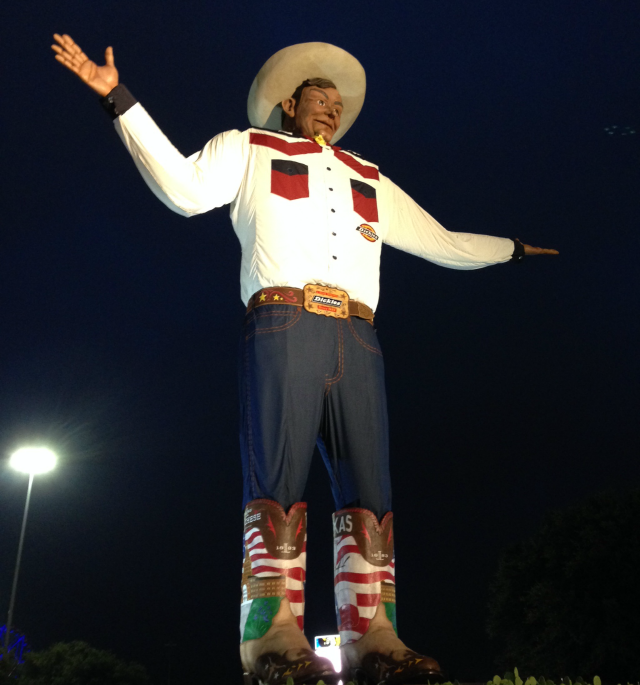 Sherry texted her Momma and told her that Big Tex looked Hispanic. Her Momma texted back that he's better that way. Y'all this is how much we love that electronic Texan. But you can't tell me that is not a beauty. Y'all just jealous your state isn't as creative. Now, Y'all don't think I could write this post and not mention Chevy. Y'all I promise every post ain't about to become a PSA for them but they did give me all them free tickets so I think they gotta get a little love today. This year since I planned on going to the fair so many times, I decided to break things up by days. This makes sure I get to do everything on my list and spend as little money as possible. Saturday when I was at the fair I made it a point to go hang out with the Chevy people for a bit. 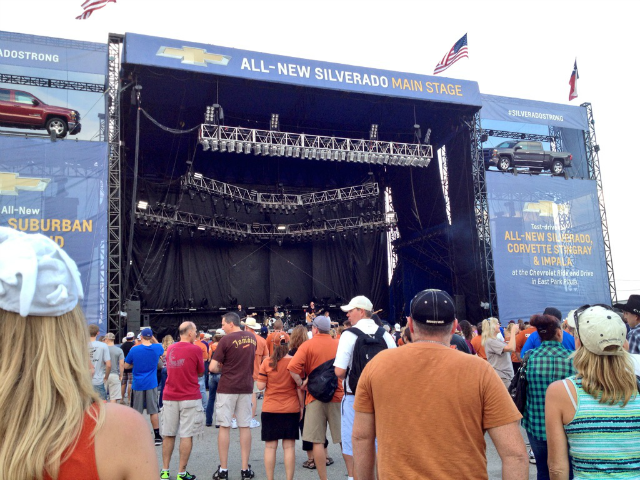 See, Chevy is a huge sponsor of the Fair. There are a couple car sections but Chevy has the largest sections and they are everywhere. Saturday I went to the ride and drive where I got to drive the new Silverados. Y'all I can't even remember half of what that boy told me but I know that truck is niiiicccee. Everyone over there was super sweet and one of the workers thought it was cool that Chevy gave me free tickets as long as I tweeted about them. Y'all know that I already tweet like crazy, especially if you follow me on my personal twitter, so I had no problem with this. When I got in the truck the course was set up like an obstacle course and was legit fun, y'all. My favorite feature of the truck was probably that it would fit someone small like me. It drove and sounded like a car. I had to scoot the seat way up. When I got out the guy told me to watch and the seat went back in place on it's own. Y'all I lost my marbles I was so excited over this. But can we talk about Chevy's marketing scheme for a second. Y'all they were genius with this tweeting. There were these swag vending machine everywhere. The machine would give you a hastag and code to use. Once the tweet went through it would say vending and then give you something. I mean, there were gift cards to name a few things they was throwing at ya. As I was standing in line a couple college kids from Texas start talking about how Chevy is a genius and they bet Chevy has been trending for weeks on twitter. I just smiled and went back to tweeting. Y'all I am overwhelmed in the swag I got this weekend. Saturday the weather was pretty gross. Wait, let's be honest. That weather was a hot mess and no fun but I wasn't about to let that stop me. Y'all know that I started a list called the Travelin' Texan. It's 100 things I want to do around Texas. Well, number 17 on that list is 'sing along to Corey Marrow' and on Saturday I got to do just that. 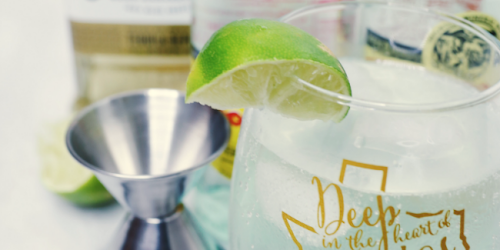 I stood in the back with my lemon chill yellin," Travelin' through Texas you and me. Wanna go time travelin' through Texas you and me" cause Lord knows I can't sing. I kept making jokes with James cause I'm not the biggest Corey Morrow fan. If his music comes up on my itunes, unless it's a certain song I'm probably gonna skip it. Wait why do I even have his music on my itunes? But back to the jokes. We were joking that it didn't matter cause it was on the list which means it has to be done. And even though I have been to the fair hundreds of times number 62 on my list was go to The State Fair of Texas and thanks to Chevy I was able to cross both those off my list. 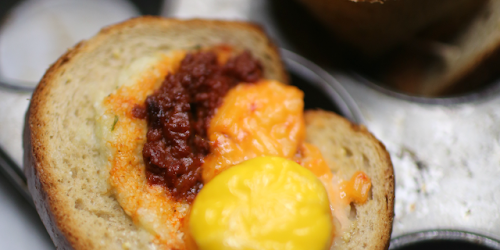 Whelp, come back tomorrow and hear alllll about the fried foods I put in my belly. Ohh, y'all don't even know. Paula Dean ain't got nothing on us. the state fair is the best!!! looks like you had so much fun! I have gone twice and i'm going this weekend- can't wait! That vending machine idea is genius! That cowboy looks kinda creepy to me...maybe its just in pics...he's electronic?